I woke up silently screaming. She’s gone, save for in my dreams. She’s with me in my dreams. Always in my dreams. Only in my dreams. …and I wake up. Vivid dream to unwanted reality in a blink. My heart is trying to beat its way out of me, through muscle and bone and skin, like it wants to be free of me for once and all. I wake freezing, awash in cold sweat. The room is dark, quiet, lonely. She isn’t next to me. The room may as well be in some hotel, or a hospital, it doesn’t feel like home, and I don’t want to be there. The wheres really don’t matter, without her, the wheres feel the same. So much sameness. Waking and loss, sunrise and pain, they hold no difference. Still, before the waking and loss, the sunrise and pain, at least she’s with me in my dreams, and that’s something. At least, it isn’t nothing. There once was this turtle, a quiet fellow, he didn’t have lots of friends, but not because he was unfriendly, he just felt like he ought to be somewhere else, with someone else. Feeling like that all the time, no matter who happened to be around, it made him quiet. He thought he couldn’t be wrong, a feeling that persistent had to mean SOMETHING. Otherwise, nothing could possibly mean anything. Still, these nebulous others, they escaped him. The feeling that where he was wasn’t where he should be made him a little crazy, and he was already a little crazy. So, he kept looking, and waiting, but nothing came to him. Nothing, until one night. One night, he looked up at the clear dark sky in total exasperation and saw a star, one brighter than any star in the sky, brighter than any star he’d ever seen. It had to be it, the other place, the other turtle, he had to get to that star. It was only a matter of how… He’d once heard tale of some lunatic turtle who convinced his fellow turtles to build a living tower of turtles… He didn’t remember the end, but no matter, it was a sign! Divine Providence! So, he gathered the town and explained that there was beauty in the night-sky, beauty to be claimed by turtles! He explained about the tower, and the star, and that once he reached the star, he’d help pull the rest of them up. So up they stacked, up up up… until he sat at the very top, near enough to almost touch the star, near enough to see… an angel? The quiet turtle who reached so far blinked, stretched nearly out of his shell, just to see the angel better, just to know she was real. He was almost there… Almost, but not quite. At the bottom of the stack, several turtles began to chain-sneeze. Within seconds, the tower had crumbled, turtles falling this way and that. Having been at the very top, the quiet turtle fell very far, very hard. He finally awoke on the ground, dizzy, visiom blurred. As the world started to clear, he saw her, a turtle he’d never seen… wearing a teal-blue scarf. She was beautiful, like the angel. She walked toward him, “Hi!” she said. He said, “Hi back…” When their eyes met, he finally knew where he belonged. There’s one settlement, The Emerald of the North, named so because it’s lush, green as the brightest emerald any person has ever seen, yet it’s surrounded by ice-capped mountains, bitter cold lands. Winter grew around this place, it’s turtle magic that keeps it warm and fertile, and completely invisible to people. When The Emerald was founded, quite unexpectedly, the cold had not yet come. The story around the founding of The Emerald goes that a group of turtles, just ten friends, five ladies and five fellows, decided they’d leave home and walk to The Edge of the World. They were, of course, mocked, as no such place could possibly exist. Every turtle knew that the world went on forever, forever and ever. If magic knew no end, why should the world have boundaries? This was the thought of turtles at the time. Still, these ten turtles insisted that if they just walked long enough, and far enough, they’d reach the much laughed at, Edge of the World. So, they said their goodbyes, some called them the stupidest turtle-folk ever to be hatched, others called them whimsical adventurers, brave enough to follow their hearts. With such chatter at their backs, they walked. They walked for what felt like a century, they lost count of how many starry night-skies they slept underneath, and how many orangey sunrises they woke to, but this meant nothing. They just walked, and walked, and kept walking, determined to prove that they were whimsically brave, not stupid. They walked, and walked, and walked a little more. I say a little, not because they did, at very long last, reach the Edge of the World, but rather, they just stopped walking. One day, they stopped to graze on the green grass under the shade of a majestic oak tree, the largest, most magnificent oak they’d ever laid eyes on. After their lunch, which was delicious, they went for a drink from a nearby lazy stream, the slowest stream with the clearest water they’d ever seen. This stream was so clear, the turtles could plainly see, and have conversation with, the stream’s resident fish. The fish, who all spoke in unison as is the way fish speak to air-breathers, invited the turtles to say and relax, just for another night. “Stay!,” they said. “You look tired!,” they said. “Rest!,” they said. The turtles were tired, and they did want to rest, so they stayed. Just the one night, they agreed with each other. Except, it wasn’t just the one night. The turtles would wake for breakfast, the green grass under that gorgeous oak. They’d go for a drink from that crystal clear stream, walk along its bank, talk with the unfamiliar fishes. This could take half a day, maybe more. After all, turtles are turtles. After the breakfast and the libation and the walking with the talking, the fishes always repeated the same three statements. “Stay!,” they said. “You look tired!,” they said. “Rest!,” they said. This went on in the same way for two weeks, until the turtles all realized something. They realized that they enjoyed the grass and the giant shady oak and that stream of water like glass, and talking with the now familiar fishes. They were happy there, finding the Edge of the World didn’t seem any better than staying right where they were. They walked enough. They stayed. They stayed, fell in love, built turtle homes, started turtle families. Their journey to find someplace very old ended up creating so much that was new. So, don’t overlook the little things, the seemingly mundane. I think turtles can feel magic because they actually bother to stop to see it. You’ll probably never find The Emerald of the North, turtles are too clever for that, but maybe if you take the time to search, and stop long enough to see it, you’ll find magic too. Maybe you’ll find it, and make it your own, and keep it safe from the cold that always comes to call. Skip all the befores, skip to right now. Skip to him holding her close, feeling her steady breathing against his cheek, the rhythm of her heart-beat lulling him to move closer. He feels the heat of her, like he’s lying next to a star that spun into his orbit, she envelopes him in white-hot light. She’s so bright, so completely there, a celestial flame that burns away everything; fear, loneliness, the knowledge of clocks and death’s certainty. Everything burns away save for his intense want. He wants to touch her, to feel every inch of her body, the secret places that make her burn hotter still. He wants to be pulled into her, to get lost inside her. She takes him without a word, their eyes communicate in a language that has existed since the beginning of everything, before sound and voice. The spark of his skin against hers bends space and time, creates a pocket-universe, a decadently exquisite place where she asks only that he come for her, and he does, always for her. She asks him to come deep inside her, to a place in which she feels him, and he feels her, and nothing else matters. 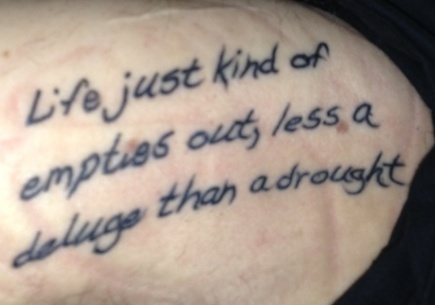 So, this tattoo, number seventy-seven, is from an Aimee Mann song, Little Bombs, which is off of one of my top ten favorite records, The Forgotten Arm. As I’ve mentioned around the blog, I died once, in some violently bright trauma room, but it didn’t stick. It was spectacularly dramatic though, my heart quit its post, a team of doctors and nurses beating the Hell out of me, trying to wake me up before all the beating in the world wouldn’t matter. My girlfriend, Sara, crying. Sara telling me not to go. It was like a movie. Had it stuck, it would have been quite something, a big, theatrical death, but it didn’t, and here we are, almost a decade later. I don’t think most death is all big and flashy, it’s slow and subtle and certain. One of my favorite writers, K.J. Bishop, has this total badass character, Gwynn. Gwynn lives by his own set of morals, he kills for cash, he kills for justice, sometimes he just kills because it’s his whim and it feels like proper etiquette to do so. He drinks hard, enjoys all manner of narcotics. He dresses impeccably, plays the piano for eccentric old ladies at swanky parties. He has fallen in love, HARD. Though Gwynn could die pretty much every day, in some grand fashion, some way that he would personally find spectacular, he doesn’t. His hold on life in the midst of combat borders on preternatural. He takes kill-or-be-killed to a form of high-art. He is death in the theater of killing. Unfortunately, even though your profession is snatching life from others, and you do it well enough to see your gorgeous, flowing black hair go gray, you’re going to have to retire. It comes time to hang up your weapons and just be. In a later short-short story, She Mirrors, we see Gwynn as an old man. His recreational narcotics are replaced by medicines for his creaky joints, aches and pains that are the cost one pays for pushing a body past its limits over the course of a career that isn’t usually lengthy. His doctor has vehemently warned him against alcohol and cigarettes. His great love is now just a memory. He’s not dying as a mercenary in some great war, he’s not dying by sword or gun. He’s dying the slow death inflicted by time. He doesn’t go quietly, at the story’s end he’s off toward one more adventure, an adventure that might not go the way he wants, that might be the last his body allows, but to Gwynn, it’s the possibilities that are exhilarating. She Mirrors is such an honest story, it resonates with me, and scares me, scares me because it’s so true. Our stories aren’t guaranteed to end how we want, or even with a quick bang. Time is what kills us, usually slowly, softly, over minutes, hours, years. The story shows how we’re all fighting against a force that we can rail at, furiously, and still, we will not win. She Mirrors brings to mind my favorite line from William Faulkner’s The Sound and the Fury. I know the words by memory, “…Christ was not crucified: He was worn away by a minute clicking of little wheels.” We’re all worn away by those clicking little wheels, the clock makes us all equals, we all get too little from time. Our clocks stop and we end. Gwynn, Christ, me, nobody gets out of it, time quitting our company. Life just kind of empties out, less a deluge than a drought, those words resonate too, those words have been important to me ever since the first time I heard Aimee sing them. I got the words permanently etched into my leg because the idea that time is slowly, but inexorably, wearing me away drives me. It could have happened way back in that trauma room, it could happen tomorrow, but probably, it’ll happen years from now, tediously and maddeningly. Still, one way or another, or another, it will happen, which is why I have bouncers carry me up two flights of stairs at the goth club, or fly to Boston during a blizzard, my antiquated breathing machine powered by an equally unsophisticated battery, with the woman I love just to see Aimee Mann play. It’s why when Sara asked, “So, would you ever go swimming?” I said, without a blink, “Yeah!” I’m terrified of being in anything larger than a bathtub, but she only got, “Yeah!” The reality that that slow drought will come is why I once told a woman I love her more than air, why I asked if she’d wake up with me tomorrow and tomorrow and tomorrow. It didn’t go how I wanted, but I did risk it. I’ll risk simple failure, I’ll risk my life, anything, because at the end of my drought, when time has shoved me toward death’s enfolding kiss, I don’t want to feel like I let time wear me away without fighting with everything in me to experience everything I want. I can’t not fight. The tattoo reminds me that my life is emptying out, and I can’t just sit back and watch it go.